Based on collections, The Salvation Army is aiming to assist approximately 12,000 families this Christmas and provide over 3,000 Christmas food hampers for those in need. The Salvation Army has charged Jamaica to beat its $16-million dollars target for this year’s Christmas Kettle Appeal. 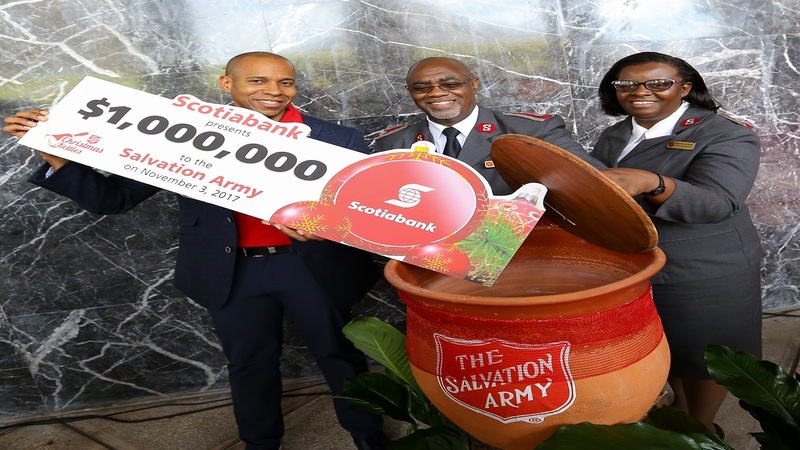 Launched last Friday on the Podium of the Scotiabank Centre downtown, the army appealed to Jamaicans from all walks of life to actively get involved in the alleviation of poverty by giving double to this year’s fund raiser. This is the 16th year of partnership with Scotiabank, who opened the Kettle drive with their contribution of $1-million. New Divisional Commander Eastern Jamaica Division, Maj. Oral Morris, expressed his appreciation for the continued support from the public that has allowed them to be able to assist thousands through their social and welfare outreach efforts during the year, and create Christmas for many who would have been without. Morris urged all Jamaicans to consider their brothers during the season and give as generously as they can whenever they see the Salvation Army officers. In 2016, the Army beat their $15-Million target raising almost 18-million in donations and as a result were able to assist 15,000 persons last Christmas with personal care products, Christmas food hampers, cooked meals and other provisions. In addition 24 institutions were visited, and numerous treats organised for senior citizens and children. Persons who experienced loss due to flooding caused by the heavy rains in St. Ann, Clarendon, St. Catherine and Portland earlier in the year were also beneficiaries, and receiving almost $2-million in relief supplies including new mattresses, beds, school clothing, back to school supplies and food hampers. Recently appointed President and CEO of Scotia Group lauded the 140 year old entity for their continued focus on alleviating poverty across the island. “We commend the Salvation Army for the tremendous work they have been doing as they continue to care for the most vulnerable in our society and societies across the world”, said Noel. In one of his first acts as President and CEO of Scotia Group, David Noel was on hand to start the Kettle Drive with a cheque of $1-million dollar donated to the charity. 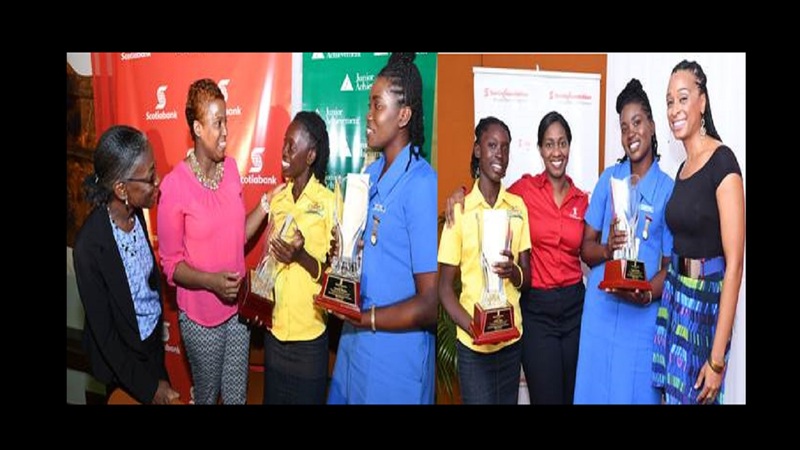 Scotiabank, who facilitates the Christmas Kettle launch in territories across the region is an avid supporter of giving back, and have through their numerous corporate social responsibility initiatives assisted many in the areas of sports, education and health. Most recently the Bank donated UD$500,000 towards the hurricane relief effort in many of our neighbouring islands. The spirit of the season was magnified by beautiful musical performances from the Salvation Army Territorial Band, the Scotia Singers, the Bank of Jamaica Singers, The Salvation Army School for the Blind and Jamaica Constabulary Force choir and band. Adults and children alike stepped forward to make their contributions, dropping coins, notes and cheques into the Kettle to make a difference to the life of a Jamaican in need. The 2017 Christmas Kettle Campaign runs from November 3 to December 24, and Salvation Army Officers with their bright red kettles and clanging bells will be outside many business places encouraging donations. Contributions can also be made online by transferring monies directly into the Salvation Army account number 2850331 at the Scotiabank Centre Branch.